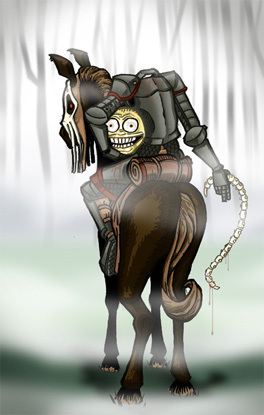 DESCRIPTION : Dullahan. One of a series of illustrations of lesser known mythical creatures. Dire is the face of the ghostly, malevolent knights known as Dullahan. With their severed head clutched under one arm like a hunk of festering cheese, they urge their nightmare steeds forward with a whip fashioned from their own spine. No one knows how these cursed creatures came to be, but their powers are well chronicled. It is said that they wander the wilderness without aim; but if they come to a rest at a location the head will be heard speaking the name of someone from that region. That unfortunate individual is doomed to perish if ever they stand in that same location. In addition, do not attempt to stop the progress of a Dullahan. Those who have tried have found themselves trampled, flailed and mysteriously splattered with gore and blood.